Having made significant investments in electronic medical record systems, hospitals of all sizes are hoping to see returns in cost savings and improved outcomes based on the data analysis capabilities EMR has promised to bring. However, many organizations lack the necessary resources to interpret data and are still searching for ways to derive meaningful insights from the data they may already have at their fingertips. 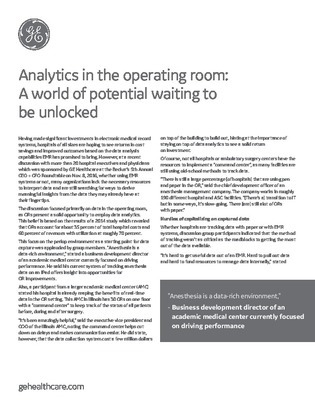 Download this white paper to learn how you can reap the benefits of data analytics in the operating room, while capitalizing on captured data.